Jennifer and I are still catching our breath from our whirlwind trip to Mill Valley and Northern California. It was a hectic yet intense few days – but worth the long drive up and back because the interviews we got for PGS were spectacular, each one of them. We have to come back to the US some time next year to do more shooting – including all the dramatic recreations, and more interviews. Before we can do that though we’ll need a substantial influx of funds to cover that section of the shoot. I’m confident that will happen soon. Yesterday I got an email from the Office of His Royal Highness, the Prince of Bhutan. The letter was to inform me officially that I have received Royal Consent to visit the country as a Guest of the State, and conduct a private interview with His Royal Highness. 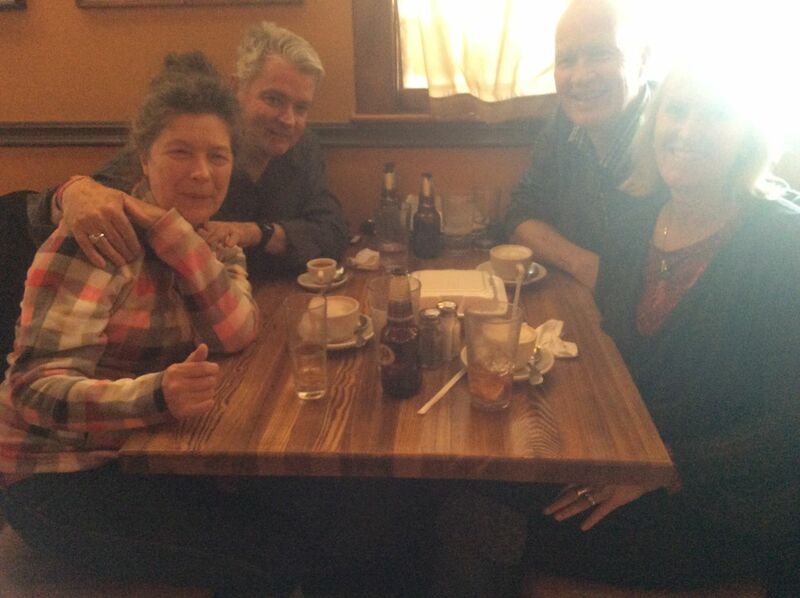 Today Jennifer and I had the good fortune to catch up with Michael and Kathryn Schlesinger, who are active participants on this blog. They drove up from Newport Beach to have lunch with us. I chose the venue – one of my favourite restaurants in Los Angeles – a Cuban restaurant called Versailles, on Venice Blvd. Even though it’s situated in a fairly dodgy part of town, the food is great, it’s reasonably priced, and it’s authentic. We talked for a couple of hours – the topics ranging from Camino stories and observations to explanations about Vedic vs Western Astrology, to what really happened in Dallas ( 🙂 ), to Michael’s current work and Kathryn’s recent time in Bali. The conversations were easy and fluid and we laughed a lot. Michael looks like Steve Martin, except he’s as tall as a pro basketball player – Kathryn just shone. In fact they both shone. That’s the thing about Camino folk – they light up a room. Through the lunch I kept getting calls from a financier about the progress of a pending deal. I’ll know more late Monday. I mentioned to Michael and Kathryn how this blog has spawned so many wonderful friendships with people from all around the world – people who we really can consider as being good friends. Michael pointed out that it’s a unique community that inhabits this blog – and I have to agree. You guys are amazing, and I’m constantly bowled over by your wisdom, your compassion, and your candid expressions of thoughts and emotions. There is a genuine feeling of respect here, I believe. We also discussed something that I’ve given a lot of thought about – and which I’ll write about in a separate post: Michael said he was astonished at how I had “exploded” the division between my personal life and professional life. Oh yes. That’s been a major decision. But I’ll talk about that separately another time. This evening Jennifer and I were invited to a party in the hills at the back of Hollywood. It was a working party, organised by a smart young film financier named Devin Rose. He’s very excited about PGS, and wanted to introduce me to some potential investors. He’s working hard on the film’s behalf. His sister is a huge fan of a movie I directed some time ago – TWO IF BY SEA – starring Sandra Bullock. I was able to give her some discreet gossip from behind the scenes. As an aside, someone mentioned to me tonight that perhaps I shouldn’t mention the commercial aspects of the Astrologer’s prediction so much. That it was contrary to the “spiritual” nature of this blog. Firstly I’m not sure if this blog does have a spiritual tone. And secondly, let’s say that what the astrologer, or astrologers (including Joni Patry from Dallas) say comes true. I want to make it publicly known that these predictions were made. It’s no good revealing it after the fact. A prediction revealed after the event is worthless. If what the Astrologers say actually comes true, then I want it documented that this is what they predicted. That then would give huge potency to the efficacy of Vedic Astrology. Tomorrow is Saturday here, and Jennifer and I will largely take the day off. We’ve not had a day off since I can’t remember when. These past several weeks have been non stop, and very intense. It’s been exhausting. But so enriching. Making this film feeds me emotionally and spiritually every moment of every day. I’m so fortunate to be in the position of collecting insights from some of the greatest spiritual minds in the world. What a privilege to be invited by His Royal Highness of Bhutan. I have not been there but my wife has been several times and loves it very much. Your wife then is very fortunate Brian. Did she go for holidays, or for work? Thanks again for your time yesterday. As you can see in the photo above, Kathryn and I always glow when we’re around you two. Enjoy the day off. It’s my favorite day in SoCal – the one after a big rain storm. Haha – we’re a bunch of Shiners!! Hey Bill wonder if you’ve had any thoughts about interviewing Oprah? She’s intuition personified! hi – (don’t know what your name is… ) – yes Oprah is a great believer in intuition. She had several pages of her website devoted to intuition. It would be wonderful if she was able to support the film. Sorry, it’s me, Vicki Hansen – as we have IndiaJiva blogs/websites I can only log in as IndiaJiva! Saw a wonderful interview with her at Stanford where she talks about her life and how intuition has lead her to make many of her decisions. Fabulous – thank you Vicki. I need to be more advanced before I go to her. But yes, she would be a terrific advocate for PGS when the time’s right.